I cook for my family and my friends. Heck, I'll sometimes even cook for strangers, if the opportunity presents itself. But my favorite thing to do is create a special treat for a friend's birthday. 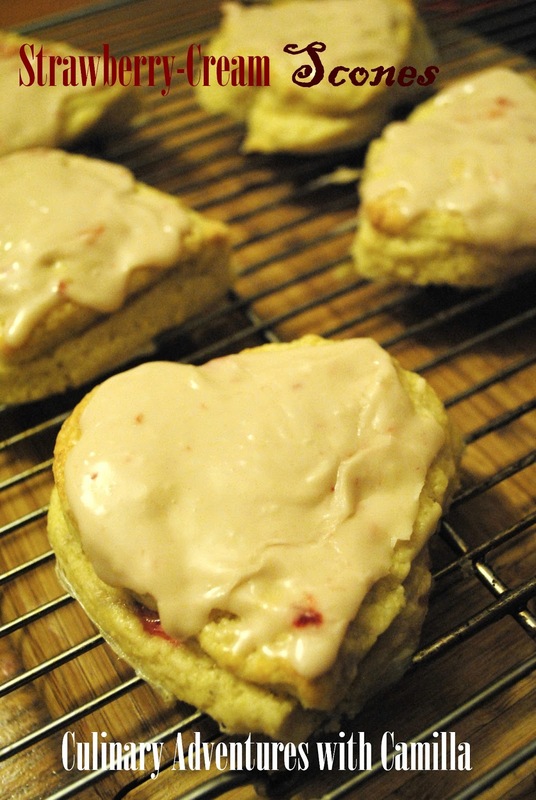 Last week, Greg - my boss and friend - called me over to his computer and showed me this link: Heather Cristo's Strawberry-Cream Scones. * I decided to whip up a batch for our Monday morning meeting...and his birthday, one day early. Well, I had to make two batches; I couldn't very well bake a batch and walk out the door without sharing. So, I did one batch for my boys at home - cut into heart shapes - and one batch for the boys at work - plain ol' triangles! The comments from both camps: "Ooooo, you can taste the butter!" "This isn't whole wheat, is it?! "; "These are not scones. These are delicious...scones are dry and, well, dry." In a large mixing bowl, combine the flour, sugar, baking soda and baking powder. Using a pastry cutter, blend the butter into the dry ingredients until the dough resembles pea-sized chunks. Add the cream and butter, using a spatula to form a ball. Transfer to a floured surface and gently press into a disc. At this point, you can use a cookie cutter or simply cut the disc into wedges. 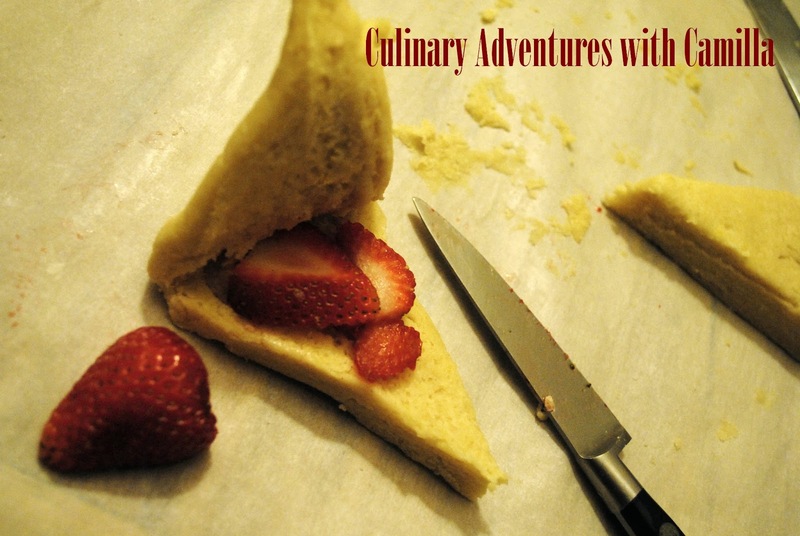 Gently slice each scone through the center with a floured knife. Put a few slices of strawberry in the center. 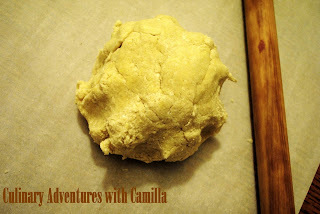 Replace the top on the scone and lightly pinch the sides closed. Drizzle a tablespoon of cream on the tops of the scones. Preheat the oven to 400 degrees. Bake at 400 degrees for 12-15 minutes. The scone will be nicely raised and slightly golden. 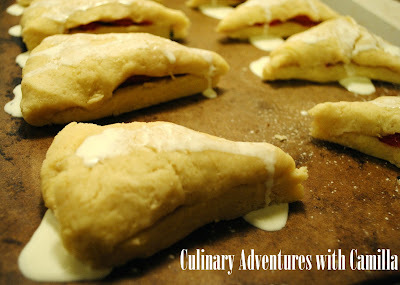 Remove the scones from the oven and set them on a wire rack to cool slightly while you make the strawberry glaze. In a small bowl whisk together the strawberry, powdered sugar and cream until you have a smooth glaze. Pour 1 tablespoon of glaze over the top of each scone. Let set up and serve warm. *This recipe was made with very few adaptations from Heather's original. I did find that I needed more cream for the glaze than she indicated.